In the heart of London's Mayfair; in a private courtyard near Green Park and Buckingham Palace you will find the exquisite DUKES hotel. DUKES is an independent luxury boutique hotel; that in 2011 won 'England's Leading Boutique Hotel' at the World Travel Awards and has been welcoming guests for more than 100 years. In accordance with such an extensive history, DUKES has perfected an unmatchable combination of quintessentially English charm and undeniable luxury within a relaxed environment that has a home from home undertone. 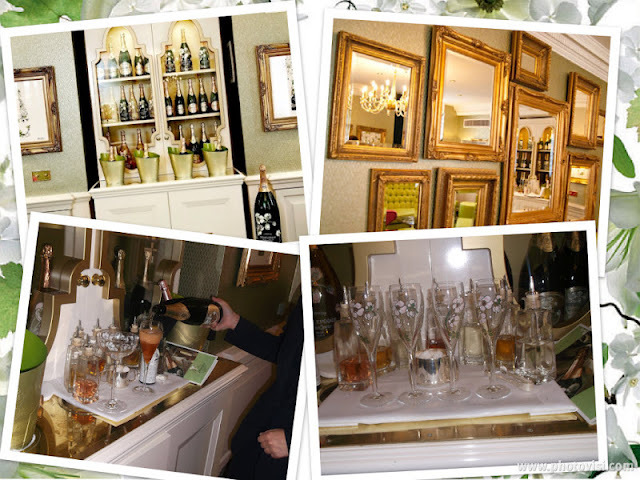 Keeping into consideration the above; it is of little surprise that the critically acclaimed Perrier Jouet Champagne producer chose DUKES as the ideal location to open its own Lounge in celebration of its 200th anniversary in 2011. The 'PJ' Lounge offers guests their finest Champagne including; the classic Belle Epoque, Belle Epoque Rose and the rare Belle Epoque Blanc de Blanc. Also available are five Champagne laced cocktails made fresh to order with an array of nibbles to accompany if so desired. The 'PJ' Lounge which opened in April 2011 was designed by Shaun Clarkson and aims to capture the very essence of Perrier Jouet. The vibrant pink and pea green lounge, accompanied with a handmade floral carpet and exclusive art work dotted around the walls reflects the 'Belle Epoque' champagne bottle. The lounge itself is airy and light with a distinctly feminine feel to it; making it an ideal location to sip on some bedazzling drinks. Guests are able to chose from a host of creations including the delightfully chocolaty ‘1811’ created with champagne, Belle de Brillet, Mozart chocolate liqueur and a mouth-watering chocolate truffle, to the elegant ‘Flower Of Champagne’ a delicate mix of champagne, rose vodka, and lillet beautifully presented with a loose rose petal. On top of this selection there is a limited edition cocktail that is released and changed every season. 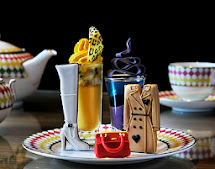 The cocktails ingredients are selected to embody the different seasons; and currently this seasons is under construction! Kate and I are avid fans of Perrier Jouet. The care and precision taken behind the creation of each bottle is truly exceptional; and this in turn results in a divine taste with each sip. 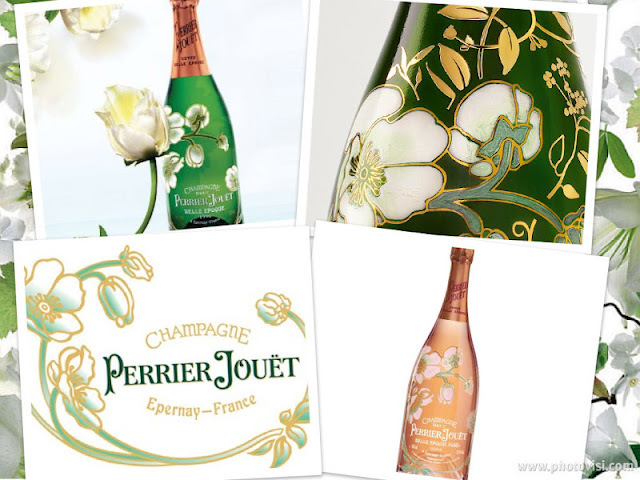 For those of you viewers who are un-aware of this luxury champagne producer; a true testimony to their level of perfection is Perrier Jouet, refused to produce a single bottle over five years because the harvest did not meet thier required standards. 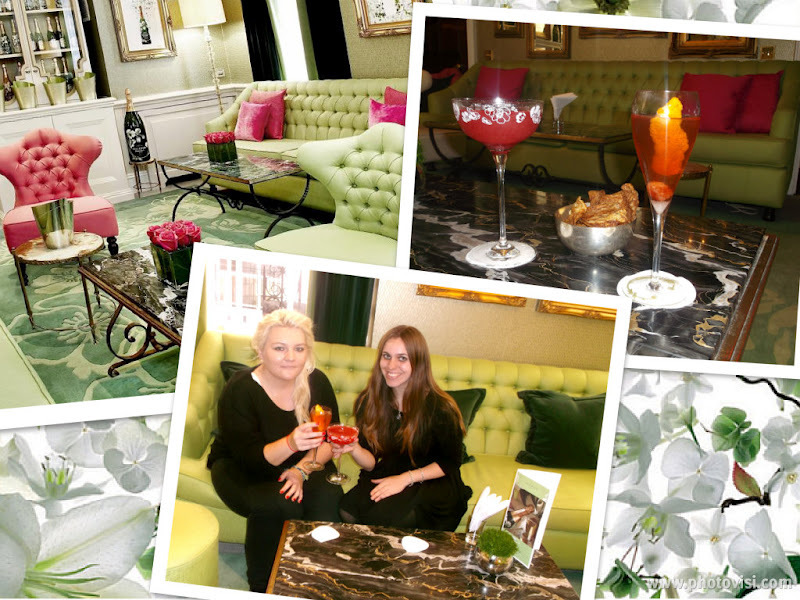 The thought of visiting the luxurious DUKES boutique hotel, to enjoy a champagne cocktail made from one of our favourite producers was truly a dreamy prospect! From the moment you approach the immediate vicinity of DUKES, you can be assured you are not only in capable hands but also complete luxury. The exterior of the hotel is visually pleasing, with a large patriotic Union Jack tastefully swaying in the air above the front entrance. On entering the hotel we were welcomed warmly and directed to the 'PJ' Lounge located on the ground floor. From the moment we stepped into the lounge our waitress, Agnieszka could not do anymore for us; ranging from answering any questions we had, advising potential drinks or simply caring about our experience. The 'PJ' Lounge is truly gorgeous! The Lounge itself is intimate and incredibly light and airy with a blend of both bygone beauty and modern decor. The contrasting pink and green really compliment the lounge, as does the mirror wall and bottles of Perrier Jouet either adding to the overall decor or standing proudly in the golden cabinet. From the menu I selected 'The Dukes Classic' and Kate, feeling incredibly indulgent tried DUKES seasonal cocktail. The Cocktails were made freshly in front of us and thus arrived promptly; mine in a flute and Kate's in a coupe champagne glass and looked dare we admit almost too beautiful to drink. The choice of glass Agnieszka informed us, is integral to the taste. The shape of your glass enhances the flavour of your champagne, whilst commandeering the bubbles in such a way as to the allow the flavours within your cocktail to burst. Kate and I can both testify that this is true. The intense taste as a result of the cocktails freshness was evident from the onset. The aroma coming from our drinks was heavenly; mine fruity with notes of orange and citrus and Kate's deliciously intoxicating Champagne. As the relaxed and upbeat music played in the background; we were able to chat, take in our surrounding and most importantly enjoy our cocktails! Kate and I would highly recommend a visit to DUKES 'PJ' Lounge; this is the perfect location to enjoy arguably one of the very best champagnes around. The Lounge is perfect for hosting an intimate wedding reception, a birthday with the girls, a treat for a loved one or simply in our case a perfect retreat from the bustle of London for some hours. The PJ Champagne Lounge is available for exclusive, private use and is the ideal venue for celebrations with friends, colleagues and business associates. Contact the events department for bookings on +44 (0)207 491 4840.